A rare pullback in tech stocks has made value investors consider the sector for the first time in a long while. If you haven't heard yet, 2018 ended on a sour note for the stock market. Many high-growth technology names got hit especially hard, and the Vanguard Information Technology ETF (NYSEMKT:VGT) was a good proxy for that; the fund fell as much as 24% from its autumn high point to finish out the year. In spite of the ugly performance the last few months, though, Vanguard Information Technology still beat the market for full-year 2018 with a 1% gain, versus a 6% decline for the S&P 500 index. 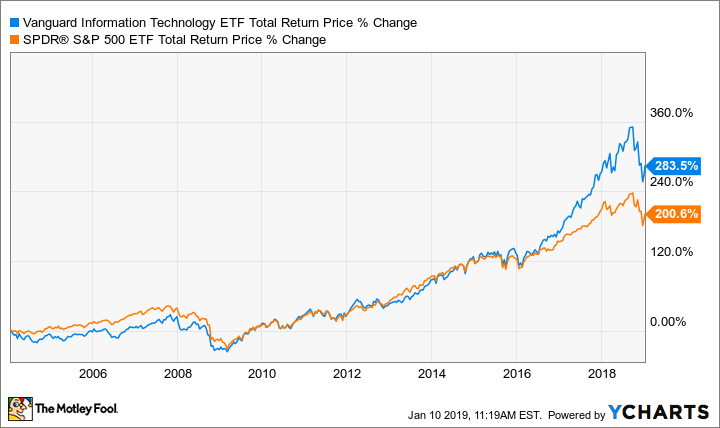 That's because technology continues to make inroads into the whole economy, and the Vanguard ETF is a good way to capitalize on its continued growth. What is Vanguard Information Technology? Vanguard Information Technology is an exchange-traded fund, a basket of companies that can be bought and sold like a stock. It carries an internal expense ratio of just 0.10% a year, contains 337 stocks, and currently yields a 1.5% dividend. With over 300 names in it, the Vanguard ETF is an easy way to get broad exposure to the technology industry. However, the fund is market-cap weighted -- the larger the company is, the larger its allocation. As such, the top 10 holdings make up 55% of the fund's total assets, so it's important to make sure these top companies are what you want in your portfolio. Holdings as of Nov. 30, 2018. Data source: Vanguard. Though the Vanguard offering is a high-growth ETF, the lineup of top holdings doesn't mean investors need to sacrifice quality. The top holdings Microsoft and Apple have been around a long time and are staples to build any investment portfolio around. Vanguard Information Technology is undoubtedly a tech-focused investment, that doesn't mean it isn't diversified. Tech reaches deep into all areas of the economy, with software services and device manufacturing a key part of other sectors -- from the auto industry to healthcare to consumer goods. The ETF is representative of technology's deep roots. Top names like Microsoft, Oracle, and Adobe provide exposure to a wide swath of software services for businesses, including cloud-based computing. The fund also has the leaders in payment processing in the mix, as well as emerging payment tech companies like PayPal. Device manufacturing is also well represented, with semiconductor stocks and consumer product makers like Apple. According to Vanguard, the underlying stocks in Vanguard Information Technology have an average trailing P/E of 22.9. That's a premium over the S&P 500's current P/E of 19.8. However, since the fund's inception in 2004, it has beaten the S&P 500 with dividends reinvested. If technology continues as the fastest-growing industry, that premium could be worth paying over the long term. ETFs play a valuable role for many investors. If your portfolio is too small to diversify with the purchase of individual stocks (I like my clients to be able to start with at least 10 to 20), Vanguard Information Technology could be an easy way to get exposure to technology. With Apple and Microsoft taking up a large percentage of the total fund, the Vanguard ETF could also be used to invest in those bellwethers with the advantage of getting 300 smaller positions in other companies to complement them. As it trades like a stock, it's also easy to purchase shares on a regular basis as part of a monthly savings plan. With built-in diversification, high-growth potential from the ever-expanding technology front, and plenty of high-quality names in the mix, Vanguard Information Technology ETF can be a prominent part of investor portfolios. Paired with its end-of-2018 pullback in spite of expectations for continued growth from the underlying companies, now looks like a good time to consider a purchase.